It is Memorial Day here in the United States; today is the official holiday, the end of the three-day weekend, during which we honor those who gave all for the cause of American freedom. It is a time for us to honor the men and women who died in the service of this country in order that we might live free. And The Legal Genealogist will never again come to this holiday without thinking of one member of my mother’s family who gave his all… a cousin I never met… and without thinking as well, with the deepest of gratitude, of the friends without whom he might have been forgotten. I have told his, and their, story before.3 But it is a story that deserves retelling, again, and again. Phil certainly tried to live up to that name. And the first to die in those terrible weeks… Philip Cottrell. The squadron had gone up about 2:30 p.m. to get in a couple hours of target practice. Phil was piloting the tow plane. When he attempted to let out the long target sleeve, it became entangled and wouldn’t unfold. Having no target to shoot at, the squadron decided to go back to the base. Phil was to pull in the “sleeve” and follow them in. Apparently, the target was blown up against the side of the engine as Phil was hauling it toward the cockpit, and it became ignited. His plane afire, Lt. Cottrell had no choice but to jump. It is believed the fuselage of the plane struck him on the head as he leaped. He never pulled the ripcord. Phil never married, his parents are both long gone, his half-sister Mattie died in 1980.17 My mother, Phil’s first cousin, never spoke of him. The only reference to him was in a note my grandmother wrote in 1951 when the family learned of John’s death: “We got word today that John had passed away Apr. 12 – John Cottrell, Mobridge S. Dak. 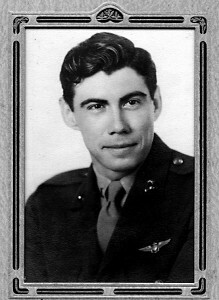 His only son Ens Philip Cottrell was killed over the Mohave Desert in a Navy training plane in 1942.”18 That information didn’t even have the service info correct. So who would remember Philip any more? And, when South Dakota put together its World War II Memorial19 and dedicated it in September 2001, who in South Dakota would care? When South Dakota began the process of putting together its World War II Memorial, it asked members of the public to particularly honor family members by sponsoring their names in a Registry of Remembrance. Roy’s youngest sister, Mary R. (Coffin) Giddings of Fort Pierre, S.D., responded by including remembrances for brothers Earl, Roger (killed in action in 1944), Roy, and Zane and sister June who served in World War II. You can see their names here by choosing Registry of Remembrance in the left menu and then entering Coffin in the search box. But that’s not all. Mary didn’t stop there: “I hadn’t heard of any Cottrells in this area and I wanted Phil to be remembered.”21 And, today, if you enter Cottrell in that search box, there he is. Philip Cottrell. Donor: Mary R. Coffin Giddings. And even that’s not all. We had no — repeat no — photos of Philip that we knew of then. Mary sent the one you see here of Philip in his uniform and a copy of the memorial text that’s now on the SD WWII Memorial site. Her sister, June (Coffin) Livesey of Georgia, who had boarded with John and Abigail as a schoolgirl, sent information we’d never have had otherwise. The whole family helped us locate Philip’s cousins on his mother’s side, from whom we received more photos, including the baby photo here. Without Mary and her family, without their friendship for Phil, without their help, my family — all of us who are Phil’s cousins — would have missed out on so much. So, on this Memorial Day 2016, we note how grateful we are for all those who have given their all in the cause of freedom and we pause to honor them and offer our thanks. But we note as well how grateful we are and we pause once again, as well, to honor those who have remembered our fallen when we ourselves could not. What a remarkable story, Judy. That newspaper find and picture are particular treasures. Thanks for sharing. We are so very grateful to the Coffin family for helping us find these, Amie. And for keeping Philip in their hearts. This truly brought me to tears. I’d like add my thanks to the Coffin family for remembering Phillip. Not bone of their bone, nor flesh of their flesh, but bonded nonetheless. That was an AMAZING story. How wonderful that the Coffin family took him as their own and kept his memory alive. I love it. We’re so very grateful to the Coffins for everything they did for Philip’s memory. Please allow me to add a few comments to the life of Philip Cottrell. 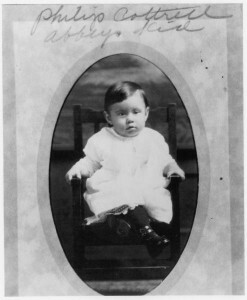 My parents were educators at Trail City, SD when Philip was in high school, and when I was born in 1939. My father was so impressed with Philip, his character and talents, that I was given “Philip” as my middle name. I was only 4 when Philip lost his life in WWII, so I never had the opportunity to meet him. My mother and Philip’s mother remained friends for life, and I have letters and momento’s from their friendship in our family files. I remember visiting Mrs. Cottrell at her home in Mobridge, when I was about primary grade age. Finding this recent entry about Philip’s life and memories of the family was a pleasant surprise and experience. That’s just lovely, Dean, and thank you so much for sharing. I’d surely love to see any of those letters or mementos that you’d care to share that might tell me more about this cousin I never knew. I’ve dropped you an email note to give you a direct email address if there is anything.